It may seem like semantics, but here are my brief thoughts on the topic. Dog trainers are not perfect, and this is the story of Kelly Keeney, the frustrated dog owner. I think it will illustrate clearly why semantics matter and how it can change your outlook on training. I do not like living in a house where dogs bark at every little thing. It makes my brain go crazy. I used to say “that is enough” to tell my old boy Bodhi it was time to stop barking. He was amazingly response even when he would have preferred to continue barking. THen I adopted Tara, my new 5 year old Swiss Mountain Dog to understand this word. We had just met and were getting to know each other and no training had been started. BOY o BOY did Tara bark at everything! I would get so edgy and frustrated with her and say the words – “that is enough”, “That is ENOUGH”, “THAT IS ENOUGH!! !” over and over again. My voice would be louder, my body language would stiffen and I would COMMAND my dog to stop barking – OR ELSE. Since it is not a trained behavior, Tara doesn’t stop barking, the words have absolutely no meaning to her. Until I finally go over, close the door, shut the blinds and give up. Tara has now learned that barking will provide the following reinforcers – Her mom will “bark”with her, approach the door and then make the “scary thing outside” go away. 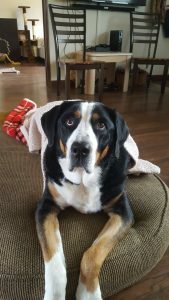 About 3 weeks into Tara living with me, I saw myself through her eyes and realized how far away from positive reinforcement I was acting, here is how I changed this for my dog and myself. I took a look at what I really wanted from my dog and made a training plan. I wanted her to bark – I believe dogs should bark and I like people to know I have a dog. I want her to stop when requested to do so, the first time I ask. Step by Step I began marking and reinforcing Tara with small piece of treats or part of her breakfast kibble ANYTIME she was near looking out the door and NOT barking. Within a week or so of daily practice, Tara would go to the door, look out and then look at me as if to say “hey are you going to give me that treat” Now we are ready to add a word for “be quiet” I began to say “Thank You” as my Cue just before marking the behavior It is impossible to yell that word so I was helping myself. Within the next three (3) days I was able to say “Thank You” and Tara would come running away from the door to find me. Now I introduced the game when she was barking. I would say “thank you”, mark the behavior and reinforce with food as soon as she stopped on her own. I stood closer to her to be sure I could catch the moments of quiet. Gradually I began getting further and further away. It took about two weeks for her to totally “get it”. Then I began to only reward every other time, or every third time etc.. Weaning off the cookies. I can honestly say that in two-three weeks she had full understanding that the words “Thank You” are a CUE to stop barking and find Mom.. There may not be food anymore, but there is always love and ear rubs! When your reinforcers don’t work…. Walks with my dog are for HER enjoyment. I love them, but my agenda stays at home. So we “go for a bumble” (Helen Philips of Clicker Gun Dog Centre), just wandering around with no real goal in mind. As long as she does not pull (or go somewhere unsafe) she is free to sniff and wander to her nose and brain’s content. Most days it is a good combination of walking and sniffing. Once day we we spent the whole hour in the parking lot of our local park. She loved it and was exhausted when we were done. Today Tara chooses a completely different route than ever before when we walk out of our home. Dog’s Point of View – Why won’t you just stop pulling??? This is a very common question among dog owners. When we look at it from the dog’s point of view we can sometimes see why they they may choose pulling as the best behavior to do on leash. Typically, the behaviors we see our dog use most frequently are the ones that we have TAUGHT our dog, whether we did so consciously or unconsciously. Once you realize what purpose the behavior serves in the dogs eyes, it will become easier to make them stronger or make them go away.